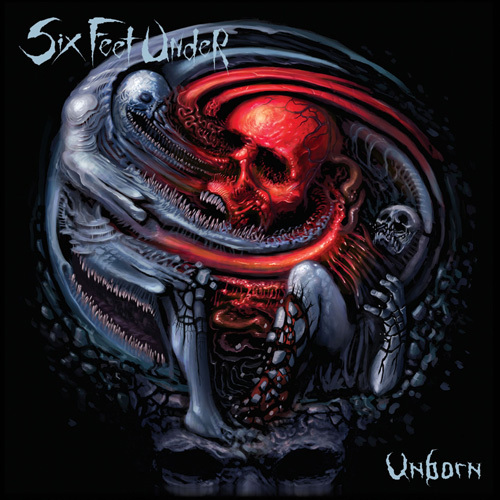 SIX FEET UNDER’s Unborn, the band’s tenth full-length album, is now available worldwide. Led by the inimitable Chris Barnes, owner of one of the most powerful and instantly recognizable voices in the genre, SIX FEET UNDER has returned with an overhauled line up that sees them reinvigorated and churning out some of the most visceral music they have ever recorded. Fans have reacted, and Unborn has landed on charts throughout North America and Europe. In Germany, Unborn charted at #37 on the Media Markt charts, and at #85 on the German Media Control Top 100 charts. In the US, Unborn debuted at #17 on Billboard’s Heat Seeker chart, #24 on the Billboard Hard Music chart, and #57 on the Billboard Indie chart. In Canada, Unborn debuted at #40 on the Hard Music charts. Unborn was released on March 15th and features tracks written in collaboration with Ben Savage (Whitechapel), Jari Laine (Torture Killer), and one of the band’s newest members, guitarist Ola Englund, as well as longtime member Steve Swanson. Check out the lyric video for Zombie Blood Curse, the first track that loosed from Unborn, at metalblade.com/sixfeetunder. While there, fans can also order their copies. Unborn is available as an exclusive European boxset edition which includes the limited Digipak of Unborn and a bonus track entitled Illusions. Additionally the box features a poster, a patch, two pins and a sticker plus enough space for last year’s Undead album! The bonus track will be featured on the vinyl version of the album as well.